The classic BBC dramatisation of Tolstoy's epic story of love and loss set against the backdrop of the Napoleonic Wars. Anthony Hopkins heads the cast as Pierre Bezuhov (a role for which he won the 1972 Best Actor BAFTA); Morag Hood is the impulsive and beautiful Natasha Rostova; Alan Dobie is the dour but heroic Andrei Bolkonsky; and David Swift is Napoleon, whose decision to invade Russia in 1812 has far-reaching consequences for Pierre and the Rostov and Bolkonsky families. The twenty-part serial was the vision of producer David Conroy whose principle aim was to transfer the rich characterisation and incident from Tolstoy's greatest novel to a television drama. 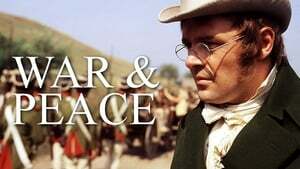 Scripted by Jack Pulman and directed by John Davies, Conroy's War And Peace boasts superb acting, award-winning design (1972 Best Design BAFTA) and breathtaking battle sequences which were filmed in former Yugoslavia.